Allen Pitts had an outstanding eleven year career, all with the Calgary Stampeders from 1990 to 2000. 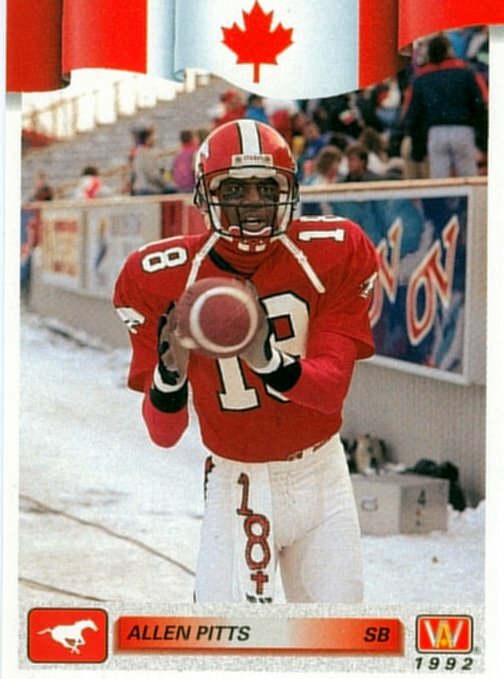 There are a lot of names that people might suggest for the greatest receiver in CFL history, and it is doubtuful that there would be unanimous agreement as to who is, but you can bet Allen Pitts would be one of the names mentioned. Pitts retired as the all-time receiving leader in yards with 14,487 yards, a total that has since only be surpassed by Milt Stegall. In his 11 season, Pitts had over 1000 yards receiving 9 times, missing twice only because of injuries. Pitts earned 7 divisional All-Star honours and 6 All-Canadian honours (1991, 1992, 1994, 1996, 1998 and 1999). Allen Pitts never had a bad year, but his best year came in 1994 when he caught 126 jpasses for 2036 yards and 21 touchdowns. Those were all career highs for Pitts, but only one of four seasons that he made 100+ receptions. The 126 receptions is currently the second highest season total in CFL history as is the 21 receiving touchdowns - though at the time it was the highest total. Milt Stegall (who else) broke that record in 2002 with 23. The 2036 yards, however, is still the all-time CFL record. Allen Pitts was elected to the Canadian Football Hall of Fame in 2006. Pitts had one rushing attempt for -5 yards in 1990. Pitts completed one pass on one attempt for 25 yards and a TD in 2000.